Education and Business Training for Floral Designers. 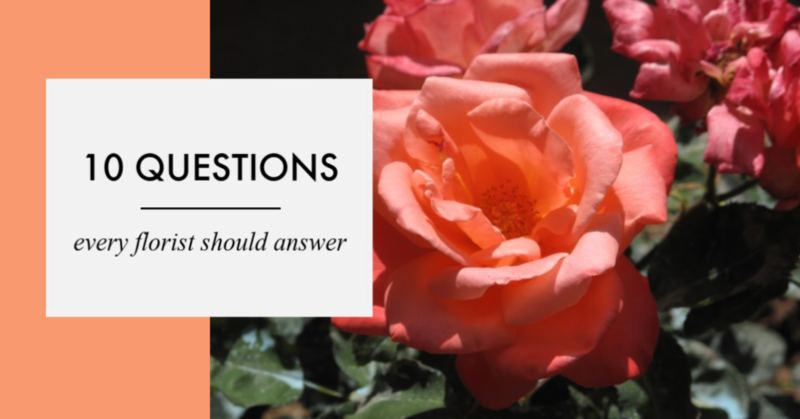 What do you need to run a floral business? Flower Boss. A Free Training Course. It’s Q2. Yes, it’s officially the second quarter of the year already. So…what did you accomplish in Q1? I want to tell you about the worst business advice I ever took. 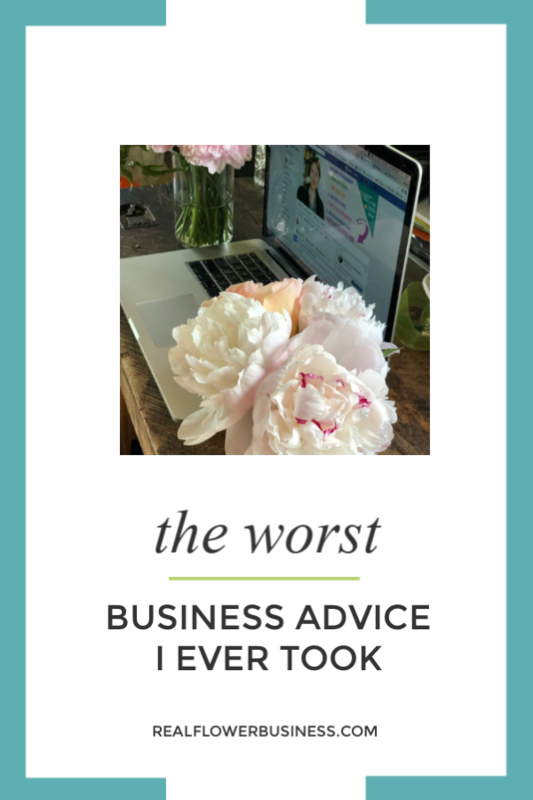 It was early in my career as a solo-business owner and even though I’d spent 8 years working in flower shops, I was eager to get new business tips….I was impressionable. What are you doing April 2nd? 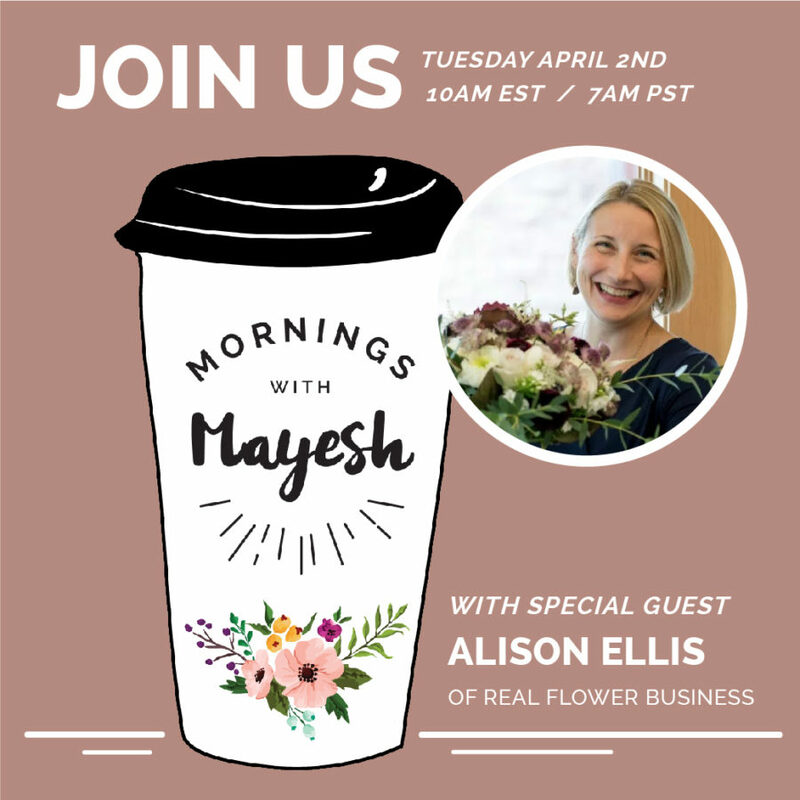 I’ll be making my 2nd guest appearance on Mornings With Mayesh and you’re invited to join us for a LIVE chat at 10am Eastern time/7am Pacific on Tuesday, April 2nd! I’ll be answering more of your pricing questions and you can CLICK HERE to submit a question for the live broadcast. 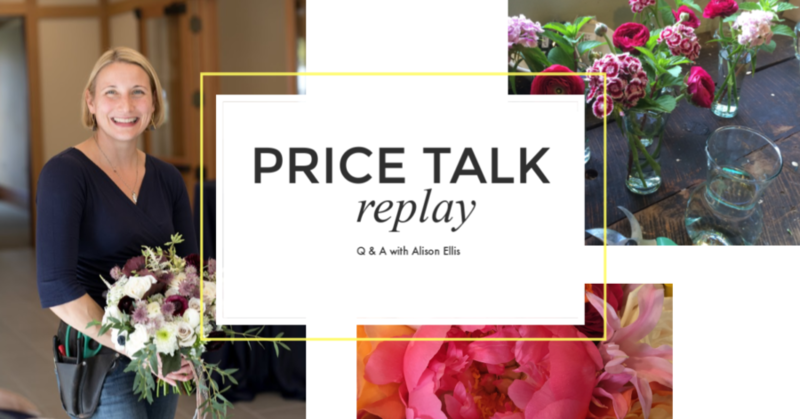 The #1 topic florists tell me they struggle with is pricing! Can florists write proposals without a recipe? 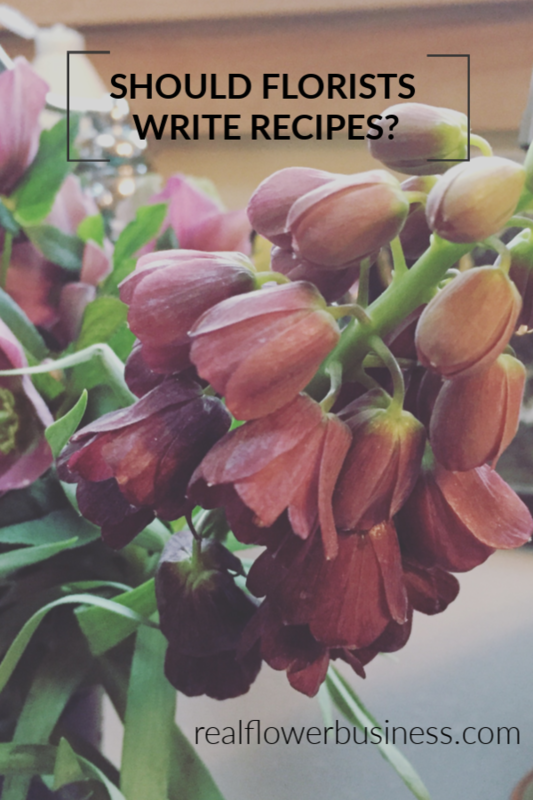 When should florists write recipes? Do you figure out stem counts before a client is officially under contract? Even with a streamlined booking process, it takes precious time and TLC to put together a wedding proposal–and I like to turn my proposals around quickly–so I don’t write recipes without a commitment from the client. Over the years I’ve established “starting prices” for the floral elements I make most frequently (i.e. bouquets, boutonnieres, centerpieces, arbors, cocktail pieces, delivery & set-up, etc.). My starting prices, or “minimums”, provide enough breathing room in the budget to create work I’m proud to deliver to my clients, without adding up each stem before we’ve actually established a working relationship (ie. a contract & deposit to secure the date), let alone finalized the design, color palette or specific floral choices. Pricing a proposal takes far less time when minimums are established for each line item. Whether you itemize an initial proposal for a client or simply offer a “lump sum total” when quoting a job, your established minimums will allow you to price as needed to turn a profit without having to write out recipes on every proposal before you get the job. and then, once final decisions are made, I’ll invest the time to create custom recipes for their event. What if you’re pricing something you’ve never made before? For example, what if you haven’t made an elevated centerpiece? If you want to join my Facebook group click here! P.S. The wedding I talk about in this video, well, I’m happy to report that it worked out GREAT!…she ended up being an ideal client after all. Customers should get to “yes” easily. It’s always easier to have a pricing conversation with a client if you’re being honest & transparent. It can be as simple as clarifying: What are your customers willing to spend? and What can you provide at that price point? Be confident in your pricing. Because if a client walks away after you’ve already offered your best price, then they’re just not your customer! They simply couldn’t afford you. Years ago, if someone said they had a $3,000 budget, I’d say, “OK, sure, I can make that work!” I mean, I should be able to make something beautiful for $3,000, right? !…well, that depends on what the client is requesting! Once I get some preliminary details from a client, I can introduce a starting price based on the information I’ve collected. The client’s requested vision may be “more than the minimum”–that’s the up-side of Pinterest….we can see immediately how elaborate and lush their dream/vision is, or get a sense of how clean, focused and simple their taste may be. Are these flowers expensive? Yes, they are. I want my customers to experience value when working with me. Charge what you’re worth and then, BE WORTH IT. Always deliver what you promise. Your brand is what you deliver. Don’t promise something you can’t deliver. Never forget the trust your clients put in you/your team. #2. How Much Does A Florist Make? #1. What Do You Do After You Meet A Bride? #2. How Long Should You Hold A Date? Get My FREE Course "How to book more weddings more quickly!"